Left to right: Green venture capitalist Vinod Khosla, who introduced Robert F. Kennedy Jr.; UCSC Chancellor George Blumenthal; and Kennedy, before Kennedy's featured appearance at Friday night's Intellectual Forum. 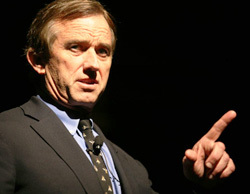 In a fact-filled, fast-paced lecture in front of a near-capacity crowd Friday night at Santa Cruz's Cocoanut Grove, Robert F. Kennedy Jr. spoke passionately about the political and economic forces that have made our country dependent on oil and coal. But he also told the 600 people who attended UC Santa Cruz's second annual Intellectual Forum that the election of Barack Obama has created an opportunity to steer U.S. energy policy in a more sustainable direction. "We have a government today that's determined to do this," said Kennedy to enthusiastic applause. Kennedy, the author of Crimes Against Nature, serves as chief prosecuting attorney for the Hudson Riverkeeper and president of the Waterkeeper Alliance. He is also a clinical professor and supervising attorney at Pace University School of Law's Environmental Litigation Clinic. His appearance ushered in UC Santa Cruz's 2009 Reunion Weekend. The third child of Robert F. Kennedy and nephew of President John F. Kennedy was introduced on Friday by Vinod Khosla, a leading green venture capitalist and a cofounder of Sun Microsystems. In brief remarks before Kennedy's "Our Environmental Legacy" address, Khosla called himself a "technology optimist." The words could describe the featured speaker as well. In fact, Kennedy said the U.S. could theoretically satisfy a large part of its energy appetite by employing existing solar technologies in a single 85 mile-by-85 mile area in the sun-rich southwestern states. "We could harness solar in that area to meet 100 percent of our electricity needs," Kennedy said. Doing so would not only lessen our dependence on foreign oil and domestic coal, he added, it would address the escalating climate change threat. The "carbon cronies" have spent hundreds of millions of dollars convincing Americans that global warming doesn't exist, Kennedy said. Their twin argument against sustainable energy: moving too quickly to bring solar, wind, and other energy sources online would cause "grave dislocations in our economy," Kennedy said. Recent history doesn't support such views, he added, citing Iceland, Sweden, Brazil, and Costa Rica as countries where movements toward sustainability created business opportunity and economic growth. Still, Obama's election doesn't remove all impediments to implementing a sustainable energy policy, Kennedy said, adding that eliminating the "built-in advantage of oil subsidies" remains one of the movement's highest hurdles. Without such subsidies, gasoline would sell for $12 a gallon in this country, which would obviously level the playing field for sustainable alternatives. Kennedy said a second significant impediment to full-scale sustainability is the inadequacy of this country's electricity grid; he added, however, that the Obama administration understands that a national investment in a grid upgrade will be necessary to realize the full potential of alternatives like solar and wind. Following a nearly 90-minute talk, delivered with no notes, Kennedy remained in the ballroom for nearly 30 additional minutes, speaking with individuals, posing for photos, and even signing a few autographs. A panel discussion on campus on Saturday morning was designed to foster continued discussion of the themes raised by Kennedy on Friday night. At the Intellectual Forum discussion, held in the Humanities Lecture Hall, three panelists discussed the Kennedy talk, as well as their own relationship to the environmental movement. Featured panelists were UCSC faculty member Daniel Press, chair of Environmental Studies at UCSC; Claire Strader, the manager of the Troy Community Farm in Madison, Wisconsin (and a graduate of UCSC's Apprenticeship in Ecological Horticulture program); and Richard Harris, science correspondent for National Public Radio (and a UCSC graduate in biology). Press described UCSC's offerings in environmental studies, adding that faculty in the program are impressed by their students' desire to make an environmental difference. "We try to take that energy and make it more rigorous and analytical," Press said. Strader, who was the top vote-getter during an online poll that was part of a grassroots movement to establish a White House Farmer, encouraged the people in attendance to make their food choices from a holistic perspective. Buying organic food from local growers does more than provide you with healthy vegetables and support your neighbors, she said; doing so also saves energy (fuel needed to transport food around the country) and "sets an example for people around you." Harris acknowledged the challenges in reporting on the environment; "when you're covering Capitol Hill and you have congressman calling global warming a fraud, you have to report that." He also drew a distinction between environmental advocacy and environmental reporting; "my job, to the extent that I can, is to synthesize [information], not to give equal weight." Sponsors of the 2009 Intellectual Forum included Comcast, ZENN Motor Company, and UCSC Arts & Lectures.